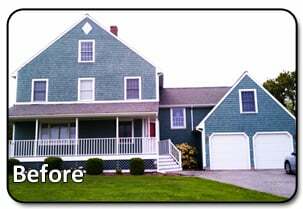 These homeowners in Portsmouth, RI were looking for a face-lift from the old rotting and peeling cedar shingles they had on their home for so long. They wanted to keep the original look to the home, but with a splash of the future in it and naturally Everlast Composite Siding was an easy choice for them. The Spanish Moss Everlast Composite siding was installed and it couldn't have been a better fit for the style the homeowners were looking for. Stripping of the old siding was required and seamless gutters were installed along with the new Everlast siding that was chosen. All the trim was replaced giving the home a completely new look and feel to it. Deciding on what your home will look like for the next 10 years or so can be a difficult decision and is a very..